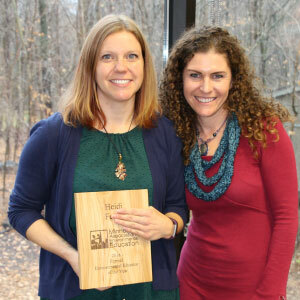 We would like to congratulate Heidi Faris, Naturalist Educator at Ramsey County’s Tamarack Nature Center, on her recent award. On Sunday, November 4, Faris was presented with the 2018 Minnesota Association for Environmental Education formal educator award. With 15 years of experience as an environmental educator, Faris is starting her fourth year at Tamarack Nature Center. She’s the Naturalist Teacher for the ECFE classes and works in the preschool classes as well. She spent the previous 10 years in the zoo world where she specialized in connecting families to nature through play experiences. In addition to teaching students, Heidi trains early childhood professionals on how to engage children in the outdoors. When it comes to the classroom, Faris has confidence in her students. “They can do hard things. They’re resilient little sponges, soaking up the world around them and bouncing back ready to take on more,” says Faris. When asked how she got into her profession, Faris said she just kind of fell into it. Beyond the classroom, Faris is an advisor for the Conservation Education Committee with the Association of Zoos & Aquariums. Heidi is the Chair for the MN Children and Nature Connection working on local initiatives to connect families with nature. Faris loves animals, kayaking, roller skating, snowboarding and going on outdoor adventures with her two boys. Posted on Tuesday, November 13, 2018 - 9:12 a.m.